Brad Knight had a miserable practice before the Forrest Wood Cup, but stuck with the one area where he got some bites and rode it to the victory. The gently sloping hillside that buffets the north shore of Big Blakely Creek still shows signs of the F-1 tornado that blistered the area on May 30, 2013. Some trees are still standing, but they�re now just crooked gray poles protruding from the ground, stripped clean of their limbs and branches and leaves. Some of the remnants of the twister are now resting at the bottom of Big Blakely, creating an underwater wonderland for bass and baitfish and other species to find refuge. 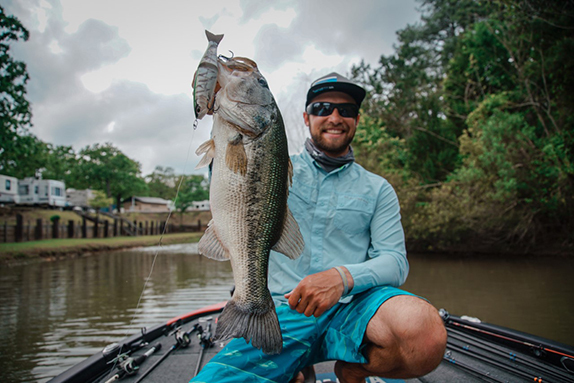 Last week, Brad Knight turned the back of Big Blakely into his personal playground as he devoted his entire Forrest Wood Cup � all 32 hours of fishing time � to picking over all of the visible and submerged targets, along with combing the mucky banks to produce the winning stringers. The Lancing, Tenn., pro who still works at the Wartburg Pharmacy when he�s home, averaged just under 13 pounds per day at Lake Ouachita to capture the Cup and the half-million dollar winner�s share. He was the only angler in the 50-man field to catch at least 10 pounds each day. 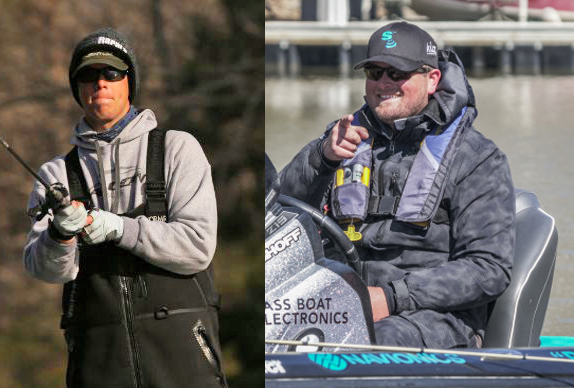 So, why�d he choose to spend his whole tournament in one small area, eventually sharing it with another angler who made the Top 10 (Mark Daniels, Jr.), when others were convinced that it would take a combination of deep- and shallow-water patterns to make a run at the win? Each day brought a different set of conditions and Knight made all the right tweaks to his strategy. His go-to tactic was a 6-inch straight-tail worm on a dropshot rig, but he also caught key fish on a trailer-less buzzbait, flipping a creature bait and cranking a shallow-running balsa square-bill. �After day 1 and especially day 2, I realized there were winning fish in there,� he said. �I had a deal figured out with the root wad (of the trees). I was really hoping that buzzbait would be the 1-2 punch that would carry me through to the fourth day. The buzzbait kind of waned so I leaned of those dropshot fish in the trees. Here�s a rundown of how Knight became the newest Cup champion. Practice for Knight was a struggle. 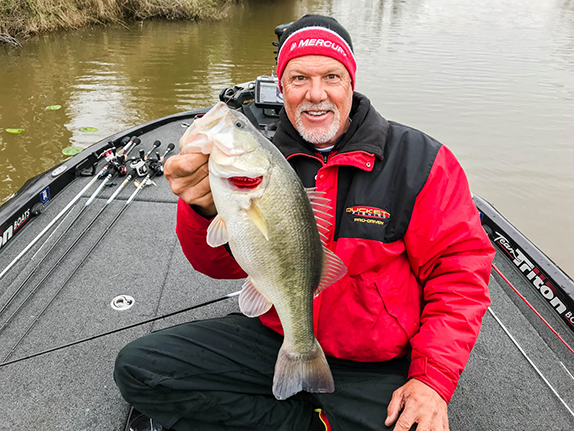 He did not visit Ouachita before it went off limits, largely because he expected the lake to change in the 2 weeks leading up to the official practice session. He got an early start on the first day of practice and intended to graph brush piles, figuring that would be a dominant pattern. He said one of the ways he likes to fish at home at Watts Bar Lake is go to the back of creeks where water runs in. Big Blakely looked a lot like home. He was camping by Stetson Blaylock near the lake during practice and mentioned the area he�d found. It was then that Blaylock told Knight about the 2013 tornado. Knight then started to make the connection in his mind that all of the wood in that creek wasn�t put there strategically - it was Mother Nature�s doing. He threw a homemade balsa crankbait and caught a couple keepers before leaving the area. Later in practice, he tried to get bites in grass pockets and out of brush piles, but neither was a consistent producer. �I thought a frog would be a big player here as well as a big sinker punching the mats,� he said. �That�s the way I like to fish and I really tried to play that in and I couldn�t get the grass thing going. I did the brush-pile thing and I could catch them on just about every place I saw, but they were all just little. I couldn�t get any consistency going with that. He came into the tournament having amassed zero keeper bites over the final 2 days of practice. When he arrived, Daniels was fishing some trees in the middle of the creek channel so Knight idled past him, all the way to back of the creek and was out of sight of Daniels by the time he started fishing. He started targeting logs and laydowns with a dropshot. He left the far reaches of the creek and fished down a flat, mud bank with a buzzbait. 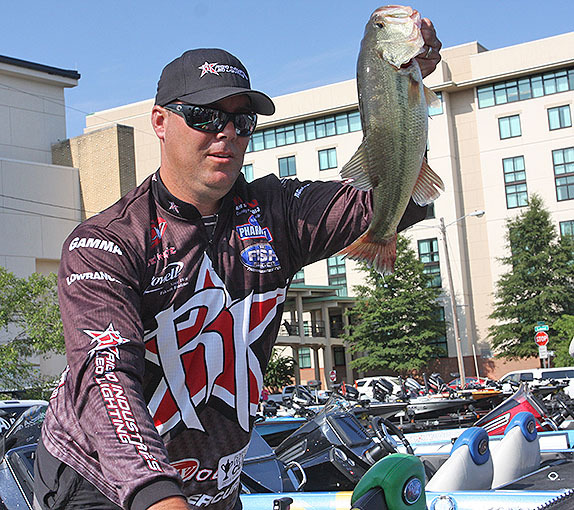 Knight loads his fish into a bag behind Bank of the Ozarks Arena on day 4 of the Forrest Wood Cup. �Mud banks are a big deal for us back home � just ugly banks that don�t stick out,� he said. �Nobody fishes them, but I got on a buzzbait deal and culled everything I had. It was just a main creek-channel flat. His 14-04 haul put him in 5th place following day 1. He returned to the Big Blakely on Friday � so did Daniels � and had a limit in the boat within an hour. He tallied 14-00 and moved into 2nd, trailing only Ramie Colson, Jr. entering the weekend. A brief thunderstorm on Saturday morning didn�t deter Knight from going back to the creek where the water kept falling as it had been all over the lake. 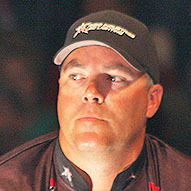 Knight said targeting the root balls, or wads, produced several key fish throughout the tournament. He bagged a limit by 10:30 on day 3 and sensed the spectator traffic in and around the creek was starting to impact the fish, so he tried other baits and other stretches. With a steady rain falling, he caught his second-best fish of the day on his last cast to give him 12-01 and keep him in 2nd place, 12 ounces behind Jacob Wheeler. By the final day, Knight felt like he was dialed in to which trees would produce bites. Meanwhile, he and Daniels continued to co-exist and share water. That didn�t happen on Sunday, which began with scattered cloud cover. He sensed the fish were getting tighter to the wood, especially the thicker pieces. �There was one tree that I started on every morning that I always caught a keeper or two on,� he said. �I went to that tree and pitched to the outside and went all the way around it and never got a bite. I could feel the pressure on the third day affected that area. He picked up two more fish on a dropshot, then went through a lull before finishing his limit with a dropshot. His next adjustment was to pick up a square-bill crankbait that he�d hoped would�ve been a bigger factor in the tournament. With a 10-year-old homemade balsa crankbait that he painted tied on, he culled four times before the end of the day. 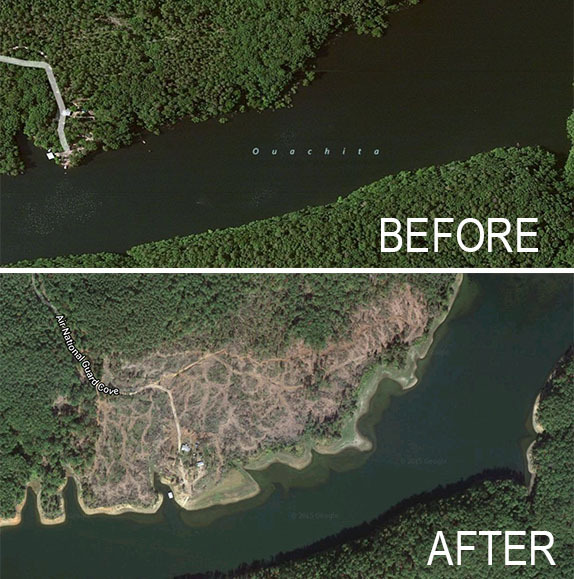 Here's a before and after look at the area surrounding Big Blakely Creek, where Knight fished during the Forrest Wood Cup. A tornado hit the hillside in May 2013, uprooting trees and scattering them in the creek. > Dropshot gear: 6�10� medium-action Powell spinning rod, unnamed spinning reel, 20-pound Gamma Torque braided line (main), 10-pound Gamma Edge fluorocarbon (leader), 1/0 Roboworm Rebarb worm hook, 6� Roboworm straight-tail worm (morning dawn), 1/4-oz. unnamed dropshot weight. > He used a 10-inch leader between the hook and weight. > Buzzbait gear: 7�4� medium-heavy Powell Max 3D casting rod, unnamed casting reel, 50-pound Gamma Torque line, 1/4-oz. Boogerman buzzbait (pearl black), trailer hook. > Having the trailer hook on the buzzbait was critical, Knight said. �All three of my big fish on day 1 were caught on the trailer hook,� he said. > Crankbait gear: 7�2 heavy-action Powell Max 3D casting rod, unnamed casting reel, 12-pound Gamma Edge fluorocarbon line, homemade balsa crankbait (silver shad). James Nuckols and Craig Powers. "Those guys took me under their their wing and brought me along and have meant a lot to me through the years." Guntersville � "It's just a place that's been pretty special to me. It has more 4- to 6-pounders than any lake I've ever been to." "Anytime I have to fish slowly"
My dad � "He's the best business person I know. He's instilled that work ethic in me." "Once I got out of high school, I missed the competition and I loved to fish. Tournament fishing is a passion for me now. 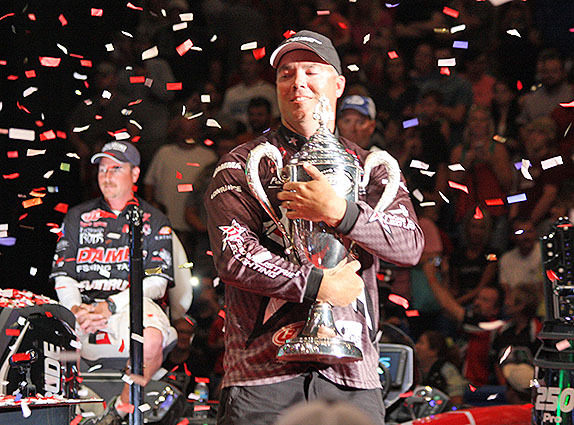 I love to compete and fish so it's like the perfect deal that came together."